Delivers 18 Highway MPG and 13 City MPG! This GMC Yukon boasts a Gas/Ethanol V8 6.2L/378 engine powering this Automatic transmission. WHEELS, 4 - 20" X 8.5" (50.8 CM X 21.6 CM) CHROME ALUMINUM (STD), TRANSMISSION, 6-SPEED AUTOMATIC, ELECTRONICALLY CONTROLLED with overdrive, tow/haul mode and tap up/tap down shifting (STD), TIRES, P275/55R20 ALL-SEASON, BLACKWALL (STD). *This GMC Yukon Comes Equipped with These Options *SUN, ENTERTAINMENT AND DESTINATIONS PACKAGE includes additional 9 months of SiriusXM Radio and NavTraffic service, (CF5) power sunroof, (DD8) inside rearview auto-dimming mirror, (UYS) Audio system with navigation and (U42) rear seat DVD entertainment system , SUNROOF, POWER, TILT-SLIDING with express-open and close and wind deflector, SEATS, SECOND ROW CAPTAIN'S CHAIRS with leather-appointed seating, 2 reclining bucket seats (STD), SEATS, FRONT BUCKET WITH LEATHER-APPOINTED SEATING 10-way power driver and front passenger seat adjusters on SLT and 12-way power driver and front passenger seat adjuster on Denali, including power lumbar control, power recline, heated seat cushion and seatbacks, 2-position driver memory, adjustable head restraints, storage pockets and floor console (STD), REAR AXLE, 3.42 RATIO, PREFERRED EQUIPMENT GROUP includes standard equipment, ONYX BLACK, LPO, POLISHED EXHAUST TIPS, LPO, ALL-WEATHER FLOOR MATS, FIRST AND SECOND ROW, ENTERTAINMENT SYSTEM, REAR SEAT DVD PLAYER with remote control, overhead display, 2 sets of 2-channel wireless infrared headphones and auxiliary audio/video input jacks. 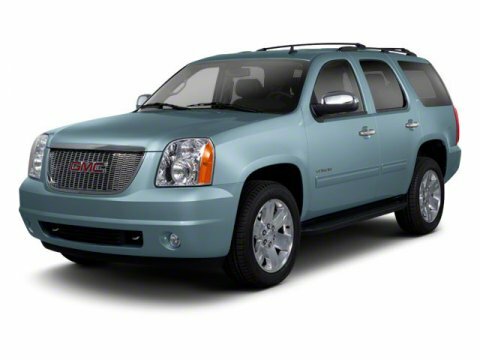 * Visit Us Today *For a must-own GMC Yukon come see us at Bleecker Chevrolet, 1200 E Cumberland St, Dunn, NC 28334. Just minutes away! Certain data and other content displayed herein is copyrighted. All rights reserved. All vehicles are subject to prior sale. While every attempt has been made to ensure the accuracy of the data displayed, HomeNet Automotive and the Dealer (Bleecker Chevrolet Used) are not responsible for any errors or omissions. All information is gathered from sources that are believed to be reliable, but no assurance is given that this information is complete and we cannot assume any responsibility for errors or omissions or warrant the accuracy of this information. * Based on 2013 EPA mileage estimates, reflecting new EPA fuel economy methods beginning with 2013 models. Use for comparison purposes only. Do not compare to models before 2008. Your actual mileage will vary depending on how you drive and maintain your vehicle.